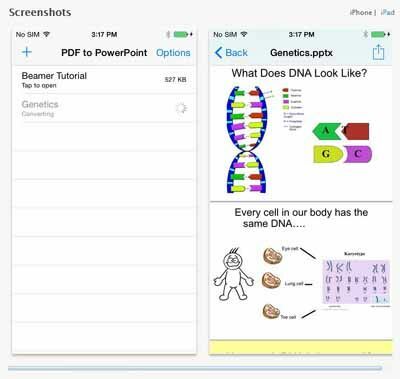 Free download PDF to PowerPoint for your iPhone or iPad. You can now download latest version and this application will help you to convert all your PDF files into PowerPoint format. There is a waiting period with the free version, however it is not long. It is implemented to ensure that all users receive their converted file. See for yourself why this is the best available free PDF to PowerPoint converter. It converts presentations trapped inside the PDF format for further reuse and editing. The converted document looks the same as the original, with all images, slides and text layout perfectly preserved. Find your PDF document and open it with PDF to PowerPoint. The conversion will start automatically. The newly converted file will then be downloaded to your iPhone or iPad. The converted document is in the .pttx format. Slide layout, image placement and colors are recognized accurately. PowerPoint presentations are optimized for fast viewing and reuse. The conversion of scanned PDFs is also possible. Your file is deleted from the server after conversion, guaranteeing its security.